Breakdown: Beginning and ending in Chinatown Square, this relatively small (around 600 participants) neighborhood run is a bit of a hidden gem in terms of Chicago races. With a flat, closed course through a historic neighborhood—runners take off from Archer Avenue and head straight down Wentworth, passing beneath the “Welcome to Chinatown” arches—and unique pre- and post-race parties, it’s surprising that after eleven years this well-run race isn’t attracting a bigger crowd. 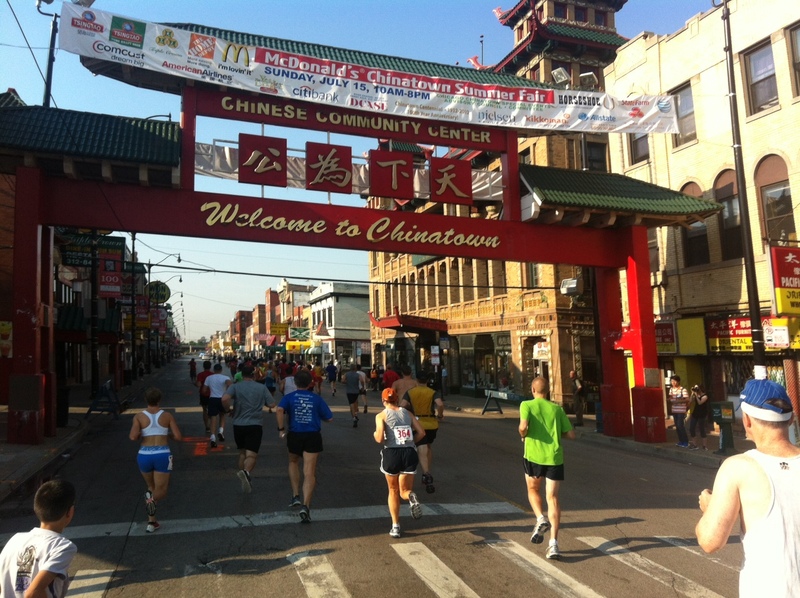 This year also marks 100 years of Chicago Chinatown, and the Chinatown Centennial 5K (usually just the Chinatown 5K) celebrated by giving away 100 prizes at the post-race party. Course: Just an out-and-back, but the fact that it’s in an area that most runners don’t experience very often (and that it’s a closed course) keeps it interesting. Running down a blocked-off Wentworth Avenue through the heart of Chinatown is exciting as is crossing the Stevenson on foot. Plenty of water stations along the way. Organization (gear check, etc. ): Gear check and packet pick-up were no problem (partly because it’s a small race). Announcements were clear and made frequently. A pre-race Lion Dance started the morning off right. Goodie Bag (includes shirt): Very cool shirt design—yellow letters on red shirt. A few flyers and a raffle entry for a chance to win one of the 100 prizes given out after the race. Lots of giveaways in the booths at the post-race party.